The CS 77-FP EI30 system ... 3D detail. 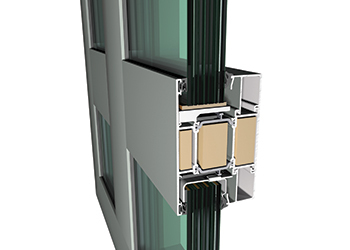 Reynaers says its CS 77-FP system, offered in 30- and 60-minute ratings, meets modern requirements for fire resistance, stability, safety and thermal insulation, while being easy to instal. In view of the increased focus on fire safety in the region, Reynaers Middle East offers a highly integrated state-of-the-art fireproof door and partitioning solution that combines high fire resistance, aesthetics and ease of installation. The CS 77-FP system from Reynaers, a leading European manufacturer of sustainable architectural aluminium solutions, comes in two versions, to retard fire for 30 and 60 minutes, both designed for inside and outside application. 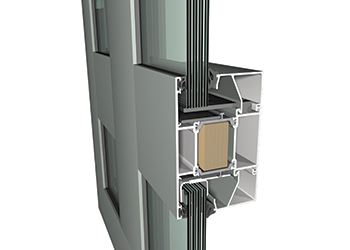 “The CS 77-FP has been designed as an extension to Reynaers’ standard CS 77 system and provides a high-quality flush door and partitioning system that caters for elevated requirements regarding fire resistance, stability, safety and thermal insulation, while offering the comfort of the use of standard profiles and components,” says Ali Khalaf, managing director of Bahrain-based Reynaers Middle East, the regional office of the Belgian aluminium systems provider. In addition to its fire-resistant qualities, it also offers features that enhance burglar resistance, access control, panic and emergency exit functionalities and smoke tightness, he adds. The CS 77-FP has been certified by various internationally recognised laboratories throughout Europe and is fully compliant with EU regulations, achieving EI30 and EI60 classification for fire resistance. According to Khalaf, the system was exposed to fire under controlled conditions, in order to determine the stability, thermal insulation and radiation insulation over a certain length of time. “This was done with glass and hardware of different suppliers, resulting in the widest possible range of approved solutions. “The system uses well-insulated profiles with cooling inserts and intumescent strips to achieve its outstanding fire- and smoke-resistant performance. The intumescent strips expand substantially in volume when exposed to heat, sealing every gap while the cooling inserts control the maximum temperature increase of the element surface, thereby containing the fire by 30 or 60 minutes with the EI30 or EI60 variant respectively,” he explains. The CS 77-FP doors can be combined with burglar resistance RC 2 in line with European testing standards EN(V) 1627-1630 and an emergency or panic function to permit users to open locked doors from the inside in case of danger. While designing the system to deliver the best possible fire resistance and safety solutions to the construction market, architectural versatility, aesthetics, superior quality and ease of construction were not neglected, Khalaf points out. The CS 77-FP EI60 composite window type. The CS 77-FP door and partitioning system also accommodates fixed windows. Its extended range of flush doors is available for all inward and outward opening door types. It is designed to accept a full range of door locks and hinges to fit all types of locking requirements, including standard single-point locks up to motorised multi-point locks, as well as fully integrated solutions in building management systems. The doors can be used in different compositions and in combination with fixed glazing to create limitless glass walls and to increase light and transparency in the building. Both single- and double-leaf doors are available up to a maximum door leaf size of 1.3 by 2.75 m, making it possible to design extra-large doors, he adds. The system is compatible with most Reynaers’ gear and its stylish Purity design handles. Slim barrel hinges are available to improve the design and aesthetical value, while the extended range of profiles has visible profile widths from 77 to 280 mm to create seamless wall connections or outstanding architectural designs. The CS 77-FP glazed partition walls and fixed window elements are available with heights up to 4.4 m for the EI30 variant and 3.8 m for the EI60 carrying glass sheets of up to 2.1 m wide and 3.5 m high, depending on the classification selected. “This allows the architect to create glass walls of practically limitless lengths. Large glass surfaces of up to 6.85 sq m (EI30) and 4.45 sq m (EI60) can be accommodated,” Khalaf says. The variations of partition walls, in combination with all possible single- and double-leaf doors, allow for extended architectural possibilities. For faster and more efficient installation, the doors can be equipped with standard single-point locks for in-house solutions for some classifications. An easy-to-use filling paste in combination with a cooling two-component glue with cooling additives replaces the labour-intensive corner treatments of mixing products, while polyurethane (PUR) foam-based building connections take over from the former mineral wool, also enabling faster and cleaner application. A single glass clip type applies to all applications and additional approved screw corner connections are provided to facilitate transportation of larger elements. Glass thicknesses of between 15 to 52 mm apply to the EI30 solution while the EI60 allows thicknesses from 23 to 52 mm. The standard clearance around glass has been increased from 5 mm to 6 mm and any standard floor connections can be chosen. Reynaers Middle East has already supplied the CS 77-FP system for a number of projects in the region including the Al Shaqab Academy and Palestinian Sudanese School in Doha, Qatar and two commercial buildings in Lebanon. Reynaers Aluminium provides innovative and sustainable architectural aluminium solutions including a wide variety of window and door systems, curtain-walling, sliding systems, sun screening, conservatories, skylights, screens and systems to incorporate blinds and ventilation grids. Established in 1965 and with its headquarters in Duffel, Belgium, Reynaers Aluminium has offices in more than 30 countries worldwide.